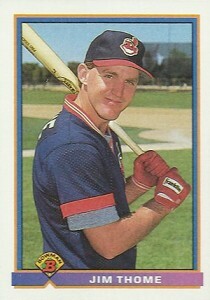 As far as rookie cards go, 1991 Bowman Baseball is a dream. However, a drab design and a standard 1991 print run (as in, more than plentiful) keep prices in check. And that's not likely to ever change. But does that mean this set is worth ignoring? Not if you're a fan of rookies and big, affordable sets. 1991 Bowman Baseball has a 704-card checklist. The big draw is the first-year players. More than 150 players have rookie cards in the set. 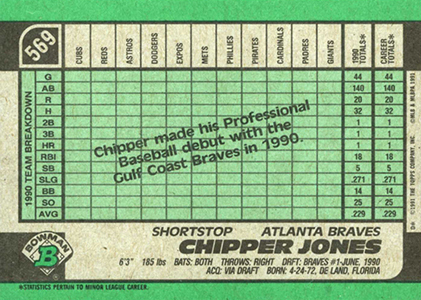 Among them are Hall of Fame-caliber All-Stars like Chipper Jones, Jim Thome and Jeff Bagwell. Mike Mussina and Ivan Rodriguez are a couple of more standouts. After these, there's a drop off in quality, but collectors can also find first MLB cards from such former All-Stars as Tim Salmon, Raul Mondesi and Kenny Lofton. For the most part, the checklist lacks frills and subsets. However, there are a couple. 1991 Bowman Baseball kicks off with a five-card tribute to Rod Carew and his Hall of Fame induction. Cards #367 to 384 have a small foil Silver Slugger notation. Several prospects have a similar MVP foil stamp recognizing minor league Most Valuable Players. Like 1990 Bowman, the design is on the plain side. Borders are white and have a thin orange and blue frame. The purple nameplate is small, holding just the player's name and the Bowman logo. While action shots are mixed in, photos lean largely towards simple portraits. Card backs are green with stats broken down by how they performed against specific teams. This is the last time the brand would use basic card stock. In 1992, the brand got a major upgrade in this regard. That, combined with a relatively lower print run finally cemented Bowman's new rookie- and prospect-driven identity. 1991 Bowman Baseball packs and boxes come in a variety of formats. Basic boxes have 36 packs of 14 cards. There are also 29-card cello packs and 38-card rack packs. Both of these have 24 packs per box. For those not interested in busting packs, there's also a factory set. 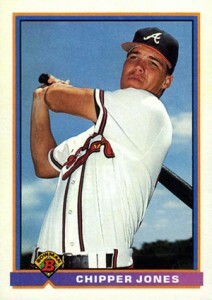 There is no Tiffany set for 1991 Bowman Baseball. As strong as the checklist is, even the top rookies can be found for a couple of dollars or less. Even in top professional grades, they're still affordable. As Cooperstown prospects rise for some of the standouts, 1991 Bowman Baseball should get some added attention but the massive supply isn't likely to mean huge gains. IVAN RODRIGUEZ 1991 BOWMAN RC #272 PSA 8 NM-MT. HOF Rangers New Case! 704 cards. Card #406 does not exist. There are two versions of #410. As stated above they could wall paper the Great Wall of China with the remaining unopened cases. Also if you have some desire to break a case/box make sure it is NOT a wax box as these are notorious for having the gum inside melt to cards making 2 per pack even more worthless than they already where. As far as Chipper Jones, Jim Thome and Jeff Bagwell. Mike Mussina and Ivan Rodriguez rookies are concerned there are other better designed and more valuable 1991 Topps Tiffany (less than 5,000 print run) available. As a guy who was a kid collecting in the mid 80’s early 90’s some sets have personal value to me overprinted junk like 1987 Topps high among them but Bowman 89-91 is pure junk box garbage, the designers did not even attempt to print something attractive to the eye. Do you know anything about a pack of baseball cards, wrapped in plastic, date on rear card is 1991 MLBPA. The front card is “Rickey Henderson” and rear card is “Gary Sheffield” and put out by “Jimmy Dean” I would greatly appreciate any information!! 2 years too late,m porobably, to answer the guy’s question above mine. But it sounds like its one of them repackaged dealies from Target or WalMart or Border’s Bookstore, with completely random junk cards from completely random sets. As far as this ’91 set is concerned, it literally does nothing for me. It’s a very bland design, especially in comparison to Upper Deck’s introductory modern slick cards.